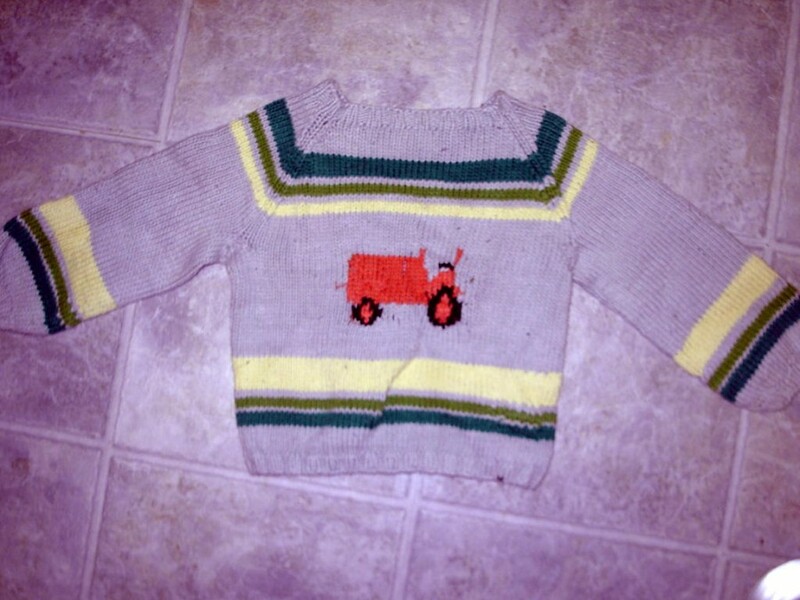 Once upon a time, there was a knitter. She was self-taught, mostly, and pretty fearless. She started with socks - which is supposed to be a no-no - because that's what she wanted; her first pair were pretty much bulletproof and stood up on their own (she hadn't quite mastered gauge at that point...) She persevered, and got better. She knit hats, and socks, and gloves, and scarves - very little daunted her. (I've posted pictures of those items recently, so...no photos. Sorry! 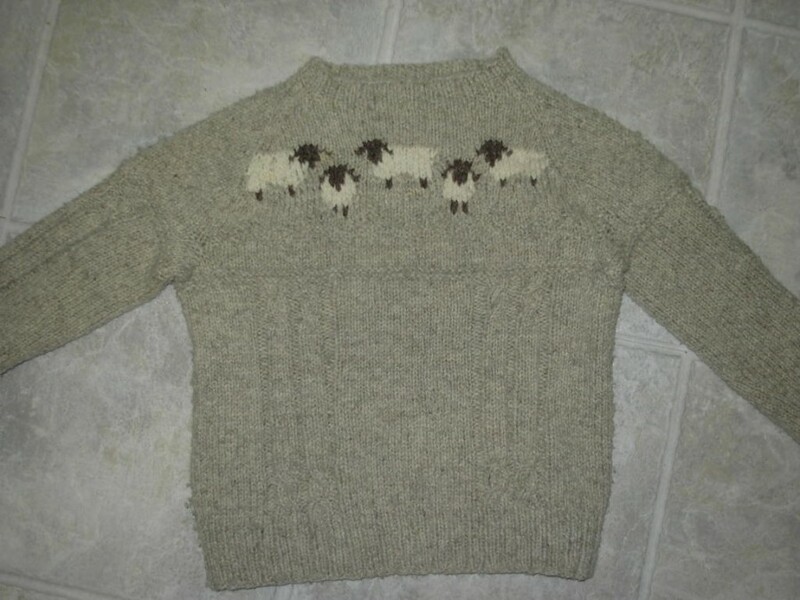 :wink:) She even knit her husband a cabled aran cardigan - 52" chest!!! There was nothing she wouldn't attempt. Except, for some reason, color work socks. THEY intimidated her. She branched into color worked fingerless gloves, which is practically the same thing as socks, but still - something held her back. 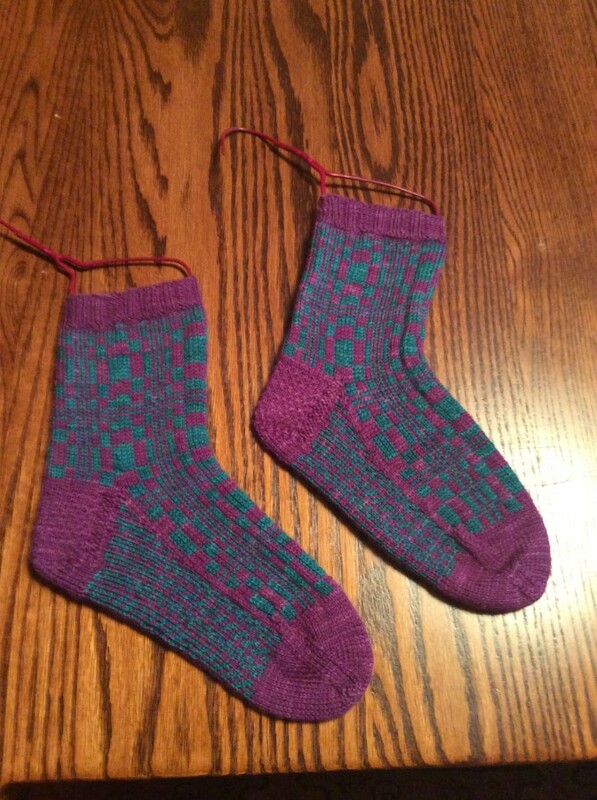 Pattern is Fibonacci Socks from Op Art Socks. Yarn is Serendipity Yarns Breathless - 80% Merino/10% Cashmere/10% Silk. LOVELY yarn - so scrumptious! So SOFT! That mountain has been conquered, and now - now, NOTHING is too difficult! 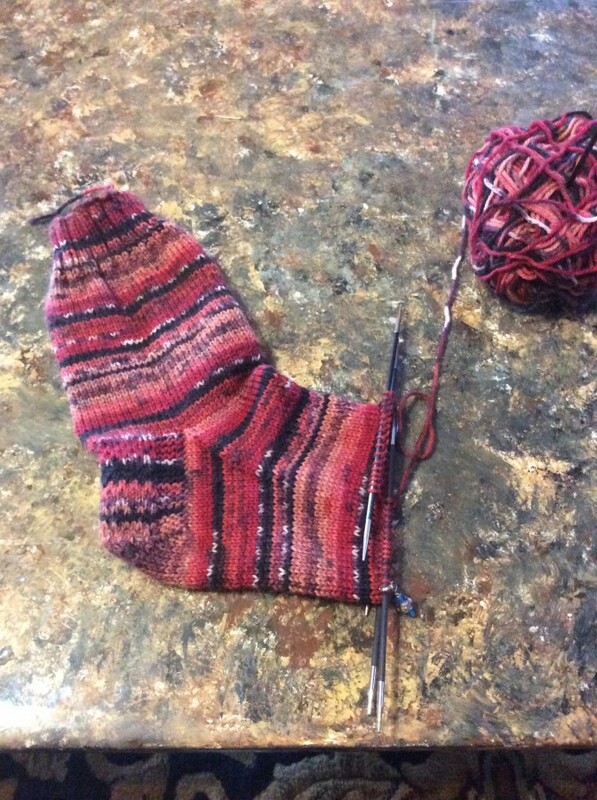 Which lead to a conundrum - so many color work socks in the queue, and a looming loss of income. What to do? "Cheap" sock yarn in solid/semi-solid colors runs about $8/ball; 2 balls per pair of socks. 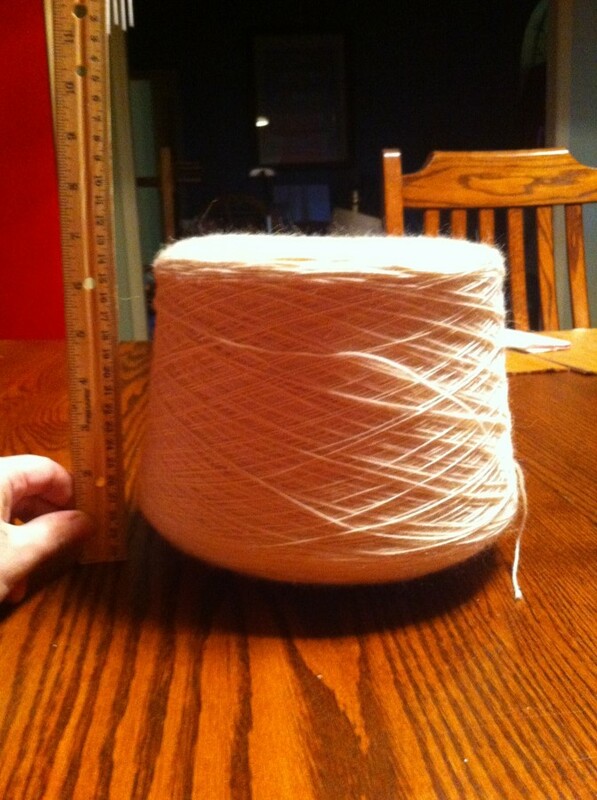 Well, the knitter is now on a roll. 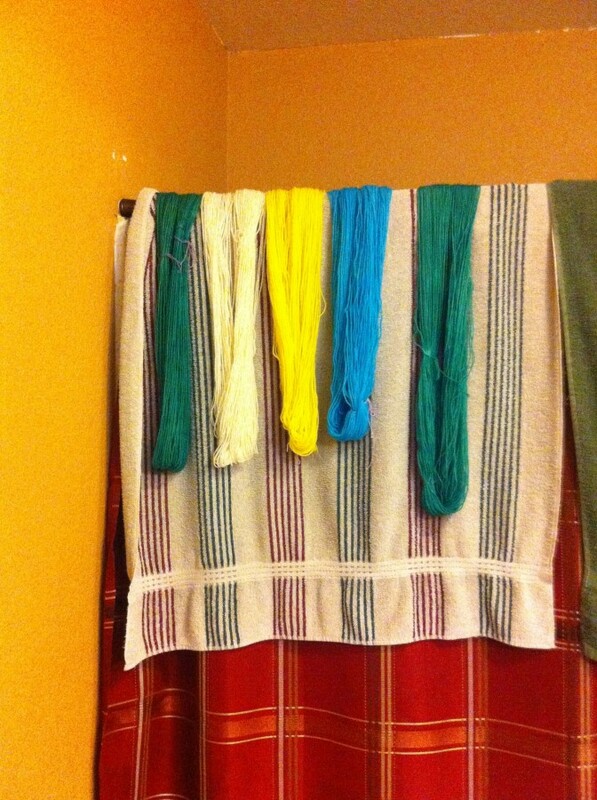 Today, 3 more skeins have hit the dye pot, and 4 more are in the queue. The plan is to dye up a bunch, then package them up to make a sort of sock-of-the-month club. The knitter - who am I kidding? *I* can just grab a baggie that has the dyed yarn and pattern in it, and I'll be ready to go with the next project. The turquoise and bright yellow are for Herself - she wants Escher lizard tessellation socks ("Maurits" from "Op Art Socks"). The emerald and white are for "Green Isle" socks (from "Socks from Around the World" - I think that's the name. Same author as "Op Art Socks" - these have shamrocks running down the leg). I have combos planned for Necker, Alhambra, Starlet....plus a few more colors just because. So. Hope your weekend has been as fun as mine! This entry was originally posted at http://fiberaddict.dreamwidth.org/787597.html. Please comment there using OpenID.